Theory of Thrifting: Napoleon is Dynamite! and taking two winter coats that I thrifted to the cleaners, my son and I made a stop at the Salvation Army. 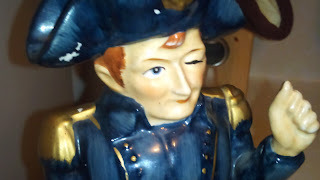 It is a Napoleon Bonaparte Dresser Caddy. At first I thought it was one of those planters that you put a cactus in and let the hilarity insue. But then I started to really take a look at it and came to realize what it was. You can store your wallet or cell phone in his hat. His arm can hold your rings or watches. And put all that cash in his pants or the little area at the base. My husband and I decided that he looks a little like Conan O'Brien with a Bill Clinton hand. Go Team CoCo!!! I looked all over E-Bay and the internet to see if I could find out any information seeing how it didn't have a tag or a maker name. It could be Napco, McCoy or Freeman-McFarlin. I am thinking Napco just looking at the other caddies made by them but I am not sure. I couldn't find another like it anywhere. It doesn't matter. 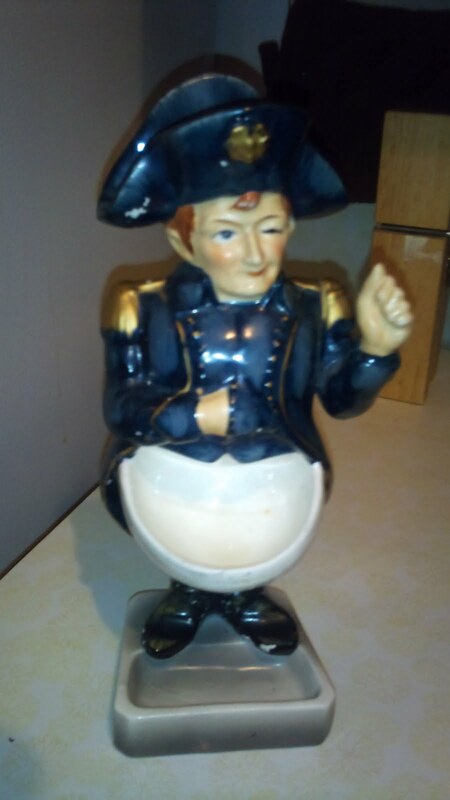 I think he is cool and he will fit into the French theme I have going on around here. I think that's the most awesome thrifted thing I've seen all week. I laughed about the Conan O'Brien/Bill Clinton likeness. You're right! Now that was a fun converstational piece to find. Thanks for stopping by today! Seriously does look like COCO! Love it!